Bitterley cold in Norfolk today. 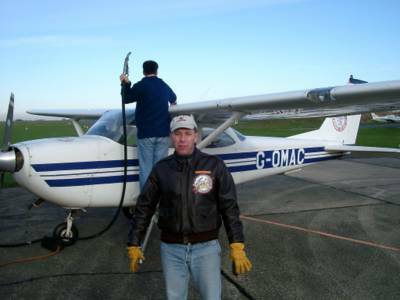 Here I am shivering during refuelling at Old Buckenham airfield, as we wait to tow an Airads banner for Crimestoppers across East Anglia. I never seem to lose the thrill of finding myself several thousand feet in the air with the nose of the aircraft pointed across the Thames Estuary to our runway on the Kent coast. Listening to the voice of the radar controller, with dusk falling and the glowing instrument panel and colour GPS, telling me exactly where the airfield is; how many minutes, how many miles? I gently trim the big Cessna into a slow descent from Clacton to a point on the grass near Herne Bay, hidden in the distance, that the aircraft will touch in the coming fifteen minutes. Watching the shipping pass beneath me, it's all great fun.